That’s a pretty way to end a long day, isn’t it? I gave in yesterday to some unhealthy eating, including things fried, and eating meat. While the meat isn’t exactly unhealthy, it did it’s usual number on me with stomach upset and I found once again that after a few bites of it, I wasn’t enjoying it. Still, I ate what was remaining on my plate to be polite because my staff bought me that lunch, and they were thrilled to share with me. Then for dinner, I was unmotivated, not to mention alone, as Mike and Griffin were at their Sunday night youth group gathering and dinner ideas just slipped in and out of my mind as the dark afternoon gathered in the quiet house. I was feeling off from the afternoon fare, and a few perusals of the refrigerator didn’t reveal anything exciting. Except a small wheel of Brie. Soon enough, this delightfully warm and enchanting snack lay on the table in front of me. A variety of nuts, chopped and toasted, were spread over the top of the heated cheese, then drizzled with a fragrant balsamic-honey glaze. A sturdy knife, some multi-grain crackers and Etta James crooning over iTunes radio to me, and an unsettled day, busy with work and people, gave way to a calmer and more focused evening. This creation would make a delicious and unique appetizer for a holiday party. It’s so simple to make too; I used pistachios, almonds and pecans for my nut topping. You could use whatever nuts appeal to you. 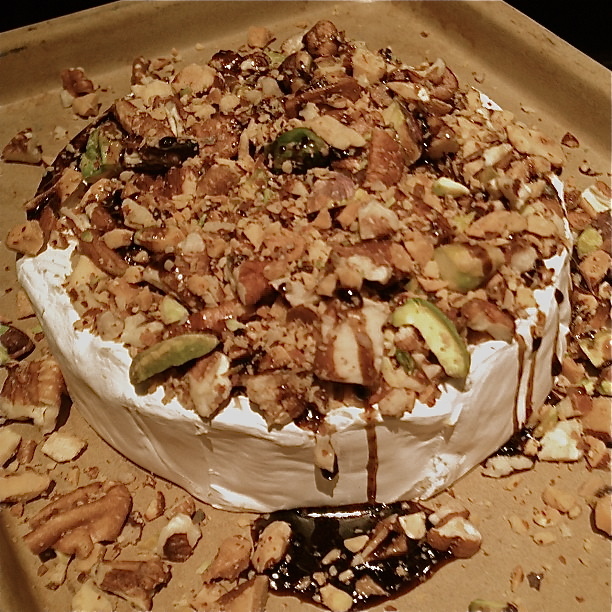 My wheel of Brie was fairly small, and I used a cup of assorted nuts. I chopped them coarsely, and toasted them in a pan until golden and fragrant. Just before I removed them, I made space in the center and dropped in about a half tablespoon of butter. When it melted and the foam disappeared, I stirred it into the nuts, then scraped them in to a bowl. Placing the same pan back on the burner, I poured about a half cup of balsamic vinegar in the pan and warmed it to steaming. The Brie was in a 375° oven on a small stoneware pan while I worked on the topping. When the balsamic was warm, I drizzled about 2 tablespoons of honey in to the pan and just let it melt and mix with the vinegar until the Brie was warmed through. Removing the Brie from the oven, I topped it with the nuts, then poured the warmed glaze over it, scraping the pan with a rubber spatula. The Brie wheel was in the oven for maybe 10 minutes, but I could have gone longer as the rind seemed a bit thick and the cheese was still firm in some spots. Time will depend on how warm and melty you want your cheese, and the thickness of the rind. I started drooling just reading the title of this post. Oh how I love cheese! I’m always looking for ways to make cheese appetizers more exciting, and this one is perfect, Kate! I love the ways the nuts are cascading over the cheese and resting in the balsamic glaze. I’ll definitely have to try this at my next dinner party. Thanks, my dear!